I hope you guys had a fabulous weekend. I sure did! I spent most of weekend spending quality time with my family and also completing a few projects around the house. Our Christmas tree is back in the garage along with our Holiday décor…In hopes of becoming more organized I compiled a list of my top twelve recipes/ projects that I look forward to making/creating in 2012 (on top of my project list and other things that may dazzle me throughout the year). I am super excited about this list. I actually have each project categorized by each month. However, I may go out of sequence here and thereJ. Wow, what an awesome idea! I really like this! 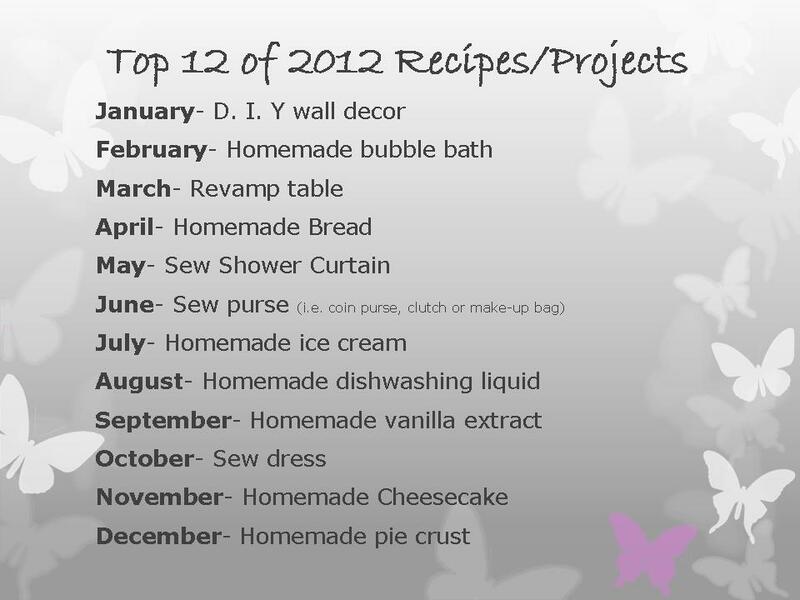 This is a cute idea... i have a project list a mile long and was thinking of doing something simmilar. perhaps if I post it, i'll feel more accountable. I love it! 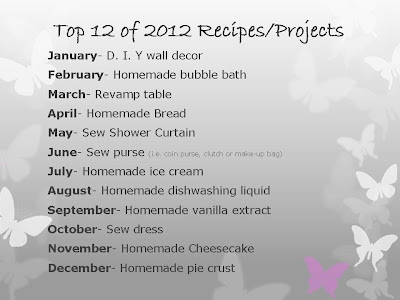 I was just compiling my list of projects for this year as well! Looks like the homemade extract will be brewed just in time for Thanksgiving and Christmas :)--smart lady! wow! a busy year indeed!.... happy new year! What great projects you completed this year! I have some vanilla extract brewing in my pantry! Happy New year! Creating a project list on your blog is a great idea. The vanilla extract is one of the recipes, I really look forward to making. I have been browsing through yours and you have a wonderful blog!! I am now following!!! I love the list! I'm sure you will accomplish all of your projects/recipes! Thank you for stopping by & becoming my newest follower.